Gravitational Waves – A New Era of Astronomy Begins – Brian Greene hosted a panel about the monumental discovery. Amazing work. The Discarded Image: Episode 01 – Jaws – I’m long overdue linking to this. Fantastic breakdown of Spielberg’s camerawork. End of Opportunity – What a run! JP Morgan is working on JPM Coin – Their own digital currency. A good take I’ve read about this is that JPM Coin will lack the benefits of some federated crypto. This whole thing is just getting started. Kevin Kelly on AR – He seems bullish. See also: His TED Talk on AI. From #25. Bezos interview from 1999 – He knew where he wanted to go and was willing to say he had no idea if they’d be successful. The product they put out is reasonably solid, but is nowhere close to what they had hyped up, and has several flaws that prevent it from becoming a broadly useful tool for development of AR applications. That is not good for the XR industry. It is slightly better than Hololens in some ways, slightly worse in others, and generally a small step past what was state of the art three years ago – this is more Hololens 1.1 than Consumer AR 1.0. He didn’t hold back. But, then again, I wouldn’t expect him to. 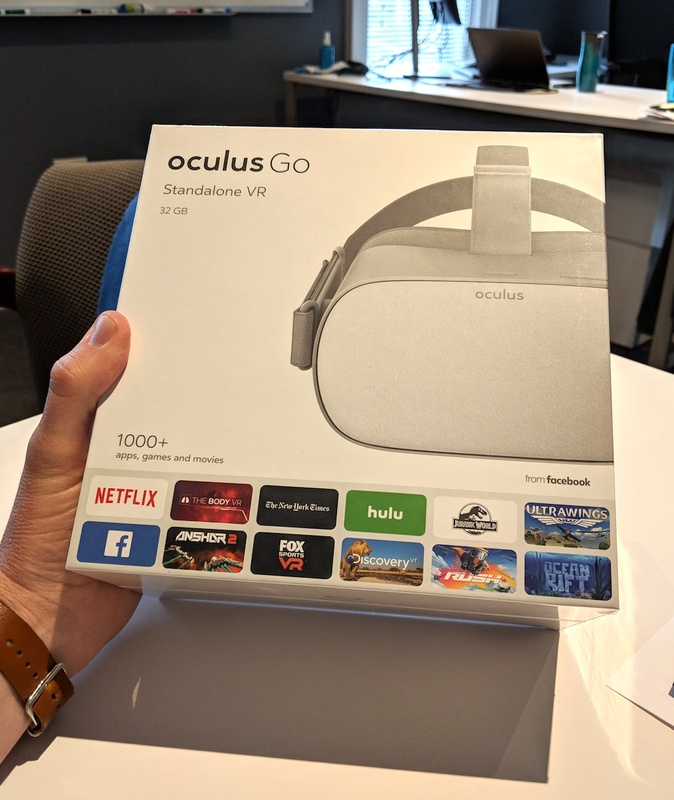 At work we picked up an Oculus Go for research and development purposes. But of course I commandeered the device first to put it through its paces and I think I have a good enough feel for it to write up a few observations. These are, as always, in no particular order. Let’s get a few things out of the way immediately: it is lightweight (I’m an adult 6′ male, I don’t know how children would feel), the controller is remarkably accurate and fun to use, battery life is fair, the sound without headphones is better than you can imagine, and the simple fact that this is a standalone device is awesome. The Go is meant to be a consumption device. While the controller is very easy to “type” with, you won’t be doing much writing within this context. That said, I can see where art apps or perhaps audio editing apps may be really interesting. Oddly though, there aren’t any. Facebook touts 1,000 apps but that isn’t true (at least to my eye). Unless they count movies or video-like experiences I do not see 1,000 apps. And the vast majority of the apps that are available are not optimized for Go. Finding high-resolution 360-video isn’t easy. Most video you stumble across within the apps is not nearly the resolution I would expect to see. Even from National Geographic. Even if I had to allow the Go to download a buffer, I would prefer the 360 video content to be much higher resolution. At this point, I prefer 2D video. I love that it appears to be a 40′ screen. Playing games is pretty fun. But I’m not much of a gamer these days (in my early 20s I wasted way too many hours playing games so I simply don’t do it anymore). So if you’re looking for a gaming review you’ll want to ask someone else. AltSpaceVR has huge potential. I’m watching that closely. This version of the Go reminds me of the original iPhone. Playing with the original iPhone in June 2007 felt like the beginning of something big. It was. This does too. Standalone VR devices should be a big hit. Esp. at this price point. App updates are rolling in daily, sometimes multiple times per day and most of the bug fixes seem to be for the Go. The Go needs a camera on the front with a quick way to turn it on/off. I should be able to pick up my phone, coffee, or move in the space I’m in without needing to remove the goggles. I’m sure the Oculus team tried this but I can’t imagine them not adding one in the near future. As I said, this is a consumption device, but I found myself wanting to use this environment for work. I want to email, write documents, chat, etc. There is no concept of multitasking within the Go. You can’t even play music anywhere in the background. I hope this changes even with a software update. I’d like to have multiple browser tabs and have sound coming from Spotify. I’ve written about how I think VR is going to change software UIs. I believe that even more now. The “window-like” environment in most of these apps seems out of place. The skeuomorphic living rooms and theaters also feel weird. I’ve had the Go for a week and the Netflix “house” already feels old. The innovation in this area is going to be very, very fast as we collectively figure this out. But my bet is that we ditch the 3D house renderings pretty quickly. I also think we’d pick up resources by eliminating that fluff. Web sites also need to be rethought for this. Just as we rethought them for mobile devices, tablets, etc. we will need to rethink web site layout, controls, navigation, etc. for VR. I’ve been giving this some thought and I have a few ideas. Mobile web sites run pretty well on Go. I use YouTube (since there is no app), Instagram, Twitter, and others this way. YouTube videos on Go are amazing. Completely immersive (even if not 360). It is my preferred way to watch YouTube. Navigating YouTube’s site isn’t great though since YouTube handles this device like a tablet. Only once or twice have I felt a little sick from using Go. Once on the rollercoaster ride the first time and once when a YouTube video was super super sporadic and shaky. My Google Pixel 2 XL comes with several panoramic and 3D photo taking options. I use them occasionally, but if I had an Oculus-like device around I’d use those features a lot more. It really feels like you’re in the photo. Some of my “Photo Sphere” shots from Longwood Gardens last weekend are just awesome in Go. You can make your “home screen” be just one of a small set of photos. Oculus calls this your “environment”. The environment options are really lacking. There should be hundreds or thousands of ways to customize your home environment. Backgrounds, animations, colors, sound, etc. I hope they update this soon with tons of options. Being in VR is not like using your phone or tablet in front of your friends or family. You are far less present. So I would expect to use a device like this when A) I’m alone or, B) when the others around me also have them. In fact, I really want to try watching movies or playing games with others in the same room. Getting oil from your skin onto the lenses happens a lot. Keep the cloth they give you handy. I’m not a particularly oily person and I probably wipe the lenses 3 or 4 times each use. The resolution of the display is fair but I can see this getting much, much better very quickly. It will have to. It would be nice if Go could connect to my Beats via Bluetooth. I think Go would be perfect for a plane ride if the flight has free Wifi, or if you already had the content you need downloaded to the device or your phone. Many of my observations sound like complaints or feature requests. But I think that is normal when something is so new. The Oculus Go has left me wanting more. Much more. Better quality, more capability, more options, and to be able to use it for more tasks. I could see myself spending hours in VR doing the same things I do on my phone, iPad, or computer throughout the day. And I think this is evidence of how good Oculus Go already is. If you are interested in VR and are looking for a completely standalone affordable solution; Oculus Go is your best buy right now. Oculus Go mini review: Impressive spacial feeling and controls. Mostly built for passive consumption, not for input. Wish the UI was more fluid and less “windowy” and also wish there was an email / calendar app. Retail AR can improve the customer experience and boost sales, by surfacing product details, displaying spatial information and navigating customers to relevant areas. Be sure to watch the video. You’ll see its practicality immediately. I think the app will be useful on a phone, but imagine it built into some glasses? I hope more companies like Dent Reality spring up and I’m positive that they will. The way information is displayed is going to dramatically change within MR applications. How should a Wikipedia page on the honey bee be shown to a child wearing MR glasses while they are touring an apiary? Certainly this new wave of information layout should not be constrained to the resizable “windows” that we see in current demos but that we will see a rich set of layout and display tools that will make mundane information that the web currently hosts to come alive. Mozilla sees this and they are skating to where the puck will be. Apple just published a page dedicated to Augmented Reality in the latest versions of iOS. It is a good page overviewing some of the use cases we’re already seeing with AR. I’ve written about AR many times, so I won’t reiterate everything today. But look at these use cases and imagine them being accomplished, not within a small hand-held rectangle, but in full view using small glasses or — dare I even say it — contacts. It will be a while yet. But this first phase will set a lot of the UI, gestures, etc. that will be implemented in whatever the next generation of hardware is. I still stand by this post. And the timeline in this post.